Jen's Gone Paleo: The Verdict is in on Paleo French Toast! Mix all of the ingredients (except for oil) in a blender, until smooth. Pour wet mixture into a large bowl of shallow baking dish. Soak bread in the mixture for approximately five minute and then flip. Soak on the second side for another 10 minutes of so...to really get the custard absorbed. *Heat the oil on a griddle or heavy-bottom pan over medium heat. Cook on first side for 5-7 minutes and then flip. Cook for another 7-10 minutes, until golden brown and cooked through. I put a lid on my french toast as I cooked the second side. 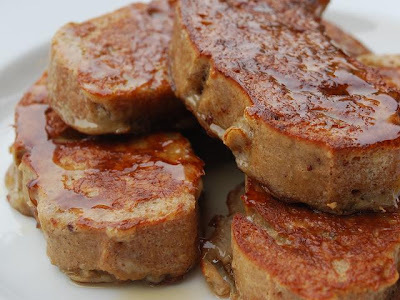 *You can also bake this french toast at 350F, for 20-25 minutes. I served this with 100% Pure, Organic Maple Syrup. It would also be great with chopped pecans, bananas, and a dollop of whipped coconut milk w/vanilla. The french toast was very good. I am a huge french toast fan, the good old fashioned "bad for you kind". This would definitely be an alternative that I can live with!!! What's the next experiment for the guinea pig!! Where do you find this bread? And what is the bread made of? I hope you make this...it was really good! LOVE all of this! So gorgeous! And that dress and her jewelry is to die for! The meaning of this is that you literally get rid of fat by consuming Coconut Fat (also coconut milk, coconut cream and coconut oil).